KIEV, Ukraine -- Groups of armed officers guarded the gate to the Main Military Clinical Hospital in Kiev on Tuesday. The fate of the imprisoned Russians remains unclear. The Kremlin seems intent on forgetting about them. No cars were allowed in. “Today we have a special system of passes,” one of the guards told drivers trying to enter the hospital’s green, quiet courtyard. The reason for the extra security measures was the presence of two Russian prisoners, self-described soldiers of the Russian special forces, being treated for their wounds. “Russians are there at Otolaryngology [ear, nose and throat] clinic,” he said. “Russians never betray their own” is a common slogan. It was often repeated in Crimea last spring, when militia in brand new Russian EMR (universal camouflage pattern) combat uniforms without insignia surrounded the airport and took over administrative buildings. Most of these militia or “little green men” were praised by locals, some received medals for helping the Kremlin carry out its mostly peaceful annexation of Crimea. That could be understood and endorsed by the Russian public. But then there’s the case of these two arrested Russian self-described soldiers. The indifference demonstrated to their fate by Russian diplomats and army commanders puts the famous slogan in question. The arrested military men introduced themselves as Sergeant Alexander Alexandrov and Captain Yevgeny Yerofeyev. They were captured this month near the town of Schastya, just 20 miles from the Russian border. Both were seriously wounded, both are facing a threat of medical complications. 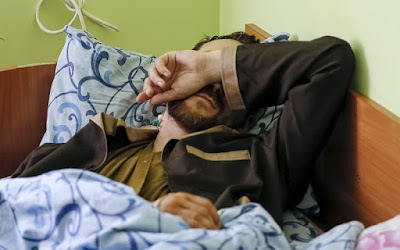 The hospitalized men told international observers that they were on a reconnaissance mission in Ukraine, but that the Russian ministry of defense did not give them any orders to attack. Ukrainian reports accused the two soldiers from the GRU, the Military Intelligence Directorate, of laying mines in the area, an action qualified as an act of terrorism. Now guarded by a dozen Ukrainian security, both Alexandrov and Yerofeyev were recovering from surgery this week after Ukrainian doctors saved Alexandrov’s leg and Yerofeyev’s arm. The soldiers’ commanders and even their own family members were claiming they were not active military. “I would prefer to be a prisoner of war. I like that status more than a recruit or a bandit,” Alexandrov told the Russian investigative newspaper Novaya Gazeta. But his hopes to keep that preferable status had been dashed when the television channel Russia-24 aired a show in which Alexandrov’s wife even went so far as to say he’d been kicked out of the military last year. “Tell me, why is this happening? I just obeyed orders. I am not a terrorist…. There was an order! I gave an oath to my motherland. I simply went,” Alexandrov said on camera. He could not believe his wife, who served in the same Tolyatti brigade, had given up on him. Alexandrov covered his face with a white towel, trying to fight back his tears. To speak with Alexandrov’s wife, Yekaterina, and find out whether she made that statement under duress, a Rain TV journalist, Timur Olevsky, traveled to Tolyatti. Olevsky had little trouble finding her. She lived in a house near the military base. But Yekaterina refused to speak on camera. Then Olevsky got into trouble. “When I was leaving her house an officer in a GRU uniform took a picture of me,” Olevsky told The Daily Beast. On Monday in Moscow, Valentina Melnikova, head of the Committee of Soldiers’ Mothers of Russia, received an email and then an SMS from Ukraine. Alexandrov, introducing himself as “a sergeant” of the Russian forces, asked Melnikova for help. The Soldiers’ Mothers organization originally was founded in 1989 and involved over 300 mothers determined to bring their sons home safe and sound from Afghanistan. Now it’s biggest concern is Ukraine. “The request was clear, the two soldiers want our committee to help them return home to Russia,” Melnikova told The Daily Beast. Melnikova’s group has suffered for its activism. After fighting in eastern Ukraine grew deadly serious in August last year, one of the members of Soldiers’ Mothers stated that 100 Russian soldiers had been injured fighting in Ukraine and were taken to hospitals in St. Petersburg. If Russian officials refused to help and recognize the two soldiers as prisoners of war “Ukraine has full right to put the two guys on trial, as terrorist, there will be a bouquet of various accusations, including international crime,” Melnikova added. On Tuesday both the Ukrainian and Russian foreign ministries confirmed talks about the two soldiers matter but so far no Russian diplomats had been let into the hospital to see the two Russian citizens. “Nobody can see the arrested ones today,” they said.